This is a very unusual book which takes an unusual look at the question posed in the title. 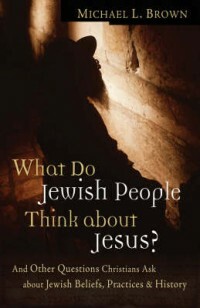 In addition to answering this question, the book is also very revealing about what Christians think about the Jews. And it may come as a bit of a surprise. Taking the basic question, as an example, "What is the cause of anti-semitism? ", most would answer that Christianity is the root. But that would be short sighted, for what then could explain the anti-semitism of the pre-Christian era? This is a valuable resource book that offers a look at the sometimes misconceived beliefs that we have concerning one another and our views about God. The whole book is done with respect towards other faiths, with no finger pointing about who is right, or wrong, concerning their individual beliefs. I have always been a proponent of the beliefs espoused in Romans, that Christianity is but a branch grafted onto the olive tree that has it's roots in Judaism. And that interpretation is borne out by the author. This was particularly gratifying for me to read,as I have had many a long discussion about this very issue with friends and co-workers over the years. In this fascinating book, the author explores, and explains, the Oral Law, the difference between the matrilineal and patrilineal descent, whether Jesus was really a Rabbi, and all manner of things related to the topic of Judaism and Christianity. More importantly it connects the two faiths without rancor. No one is calling upon you to accept Jesus as the Messiah. Rather, the book serves as an explanation to the myriad of questions and misinformation that abound concerning the subject of Messianic Jews. This book will not change your mind, and I don't believe that it was meant to. Instead, it serves as a bridge, fostering a bit more understanding between two of the world's oldest faiths. I received this book as a gift from Matt Corbin, a vendor, who was selling toys at the mall last week, just before Christmas. Somehow we got to talking and the subject came around to religion. We found that we had a lot in common, and then he pulled out a copy of this book. After a bit of discussion concerning the topic, Mr. Corbin gave me the book. I promised to give it a read after the holidays. I ended up reading it during the holidays. Well done to the author, Michael L. Brown, for taking such a potentially divisive subject and keeping it well centered and informative. And a very special thanks to Matt Corbin for alerting me, and presenting me, with such an interesting read. Labels: Biblical History, Christianity, Judasim, Messianic Jews, Michael L. Brown, Religion, What Do Jewish people Think About Jesus?